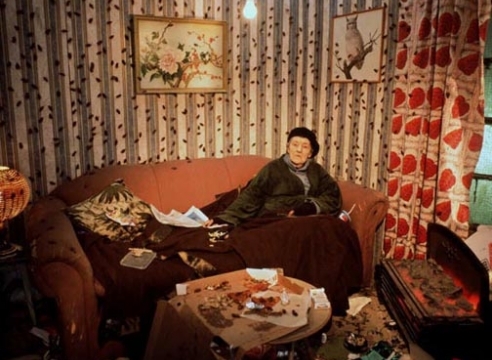 British artist Tom Hunter uses photography to comment on the contemporary social realities of specific sub-cultural groups, predominately in East London, such as squatters and travelers, among whom he lives and works. Creating formal, stylized compositions based on historical paintings, Hunter’s richly colored cibachrome prints imbue the modest events and landscapes he photographs with a status and dignity that they would not usually be given. For the series Persons Unknown, Hunter created powerful portraits of squatters who formed a community by settling in the abandoned warehouses of Hackney, in east London. In one of his best-known images, for which he won the Photographic Portrait Award at the National Portrait Gallery in 1998, a young woman with a baby beside her reads a possession order, illuminated by the light from the window that she faces. Hunter’s use of a strong and direct light source, combined with the contemplative pose, which we see repeated throughout this series, directly references the paintings of Vermeer, lending the scene a strong sense of gravitas. Adopting a similar technique in subsequent series, (he utilized the work of the Pre-Raphaelites in his later series, Life and Death in Hackney, for example) Hunter continues to bring to light the political, social, and cultural issues faced by the people of East London. Born in 1965 in Dorset, Tom Hunter lives and works in East London. He received his BA from the London College of Printing and his MA from the Royal College of Art. He is Professor of Photography at the London College of Communications, University of the Arts, London. 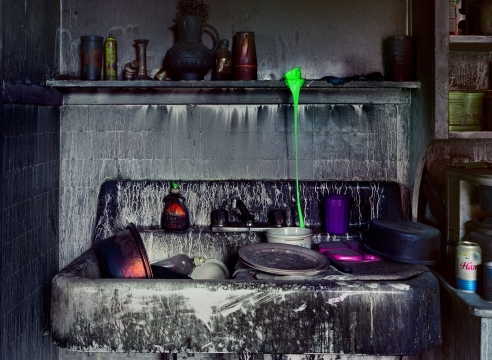 Hunter has won numerous awards, including The Rose Award for Photography, Royal Academy, London (2016) and an Honorary Doctorate of Arts, The University of East London (2011), among others. He has published six books including Le Crowbar (2013), and The Way Home (2012). Hunter’s work has been exhibited nationally and internationally at major institutions including National Gallery, Washington, D.C.; National Gallery, London; Serpentine Gallery, London; Moderna Museet, Stockholm, Sweden; Victoria & Albert Museum, London; and Tate Britain, London. His work can be found in numerous public collections including Museum of Modern Art, New York; Victoria & Albert Museum, London; Moderna Museet, Stockholm, Sweden; National Gallery, Washington, D.C.; National Gallery, London; and Los Angles County Museum of Art.